Buckskin Mare both hind socks, mixed mane and tail. Delight is a spunky little mare with that wonderful buckskin colour. 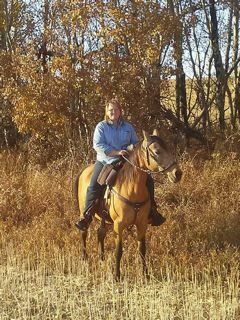 She was originally owned by Sheila Haines who did a lot of endurance, and trail riding, even had her broke to a cart. Out on the trail she is a smart mover, liking to cover the miles. Although she isn't a big striding horse, she is lot of fun to ride giving her ride a secure and safe feeling, even when grouse explode in front of her face. She's double reg. (TWHBEA & CRTWH). For someone who just likes to get on and GO, Delight is lots of fun to ride , she seems to have endless energy. If you let her go past her running walk she does a nice rack. Delight hasn't been rode very much in the past few years, she has raised a few foals. But she is the kind of horse that can sit in the pasture for a year then you can saddle up and go for a ride.